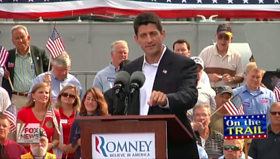 Will VP Candidate Paul Ryan Excite Tea Party Voters? Will GOP Vice Presidential Candidate Paul Ryan help get the grassroots excited to get to the polls on the election day? Amy Kremer, Chair of Tea Party Express, went "On the Record" to discuss her thoughts on the matter. "I think he's a great choice. I think it's a risky choice, but you now to gain anything in life, you have to risk something; and with a big risk comes a big gain, but I think America is ready for it. We need somebody who is willing to step up to the plate and make these bold, tough hard decisions that need to be made, and Paul Ryan is willing to do that. I think what this shows is that it's going to give the grassroots a little more confidence that Romney is serious about buckling down and getting to business." What do you think? Does Paul Ryan get you revved up for November 6th?